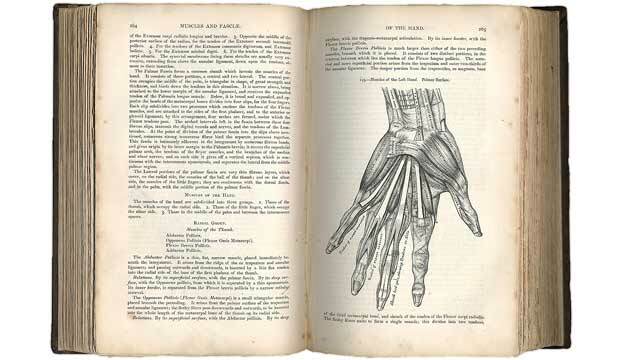 From hand-drawn illustrations to CD-ROM technology, Gray’s Anatomy has advanced with medicine throughout its 150-year existence. In Galen’s Greece, dissecting a human corpse was strictly taboo. To gain insight into the human body, anatomists instead dissected monkeys, dogs and pigs, an approach that led to certain misconceptions. Galen, for example, thought the human liver had five lobes like a dog’s, rather than two. During the sixteenth century, the Belgian anatomist Andreas Vesalius corrected many of the ancients’ errors. Having dissected unclaimed corpses and the bodies of executed criminals, he authored the first heavily illustrated anatomy book. Still, the study of anatomy held no practical value until the mid-nineteenth century, when chloroform, the earliest anesthetic, was discovered. The surgeon’s territory widened to many new areas of the body; as a result, medical students had much more to learn. Gray’s was not the first text of its kind, but it gained acclaim for the clarity of its descriptions and the beauty of its illustrations. Carter and Gray had dissected countless cadavers, using little from previous textbooks. The book was larger than the typical pocket-size medical text, making the illustrations more readable. For further ease of use, Carter labeled anatomical structures with their names rather than with tiny numbers that obliged the reader to flip to a key elsewhere in the book, as was customary. And at 28 shillings it was eminently affordable. Since 1858, it has been translated into more than a dozen languages and has sold millions of copies worldwide. Each new edition is a little bulkier than the last as medical knowledge continues to expand—and each bears less and less resemblance to the original. The current edition (the thirty-ninth) includes high-resolution CT scans of tiny anatomical elements such as the inner ear’s petrous bone, which Gray and Carter could not have observed. It also comes with a CD-ROM that provides nine “fully rotatable, strippable anatomical models,” as well as a regularly updated online component. Alas, all of Carter’s wood-block illustrations have been replaced by scans, photos and other drawings, and very few words are Gray’s.